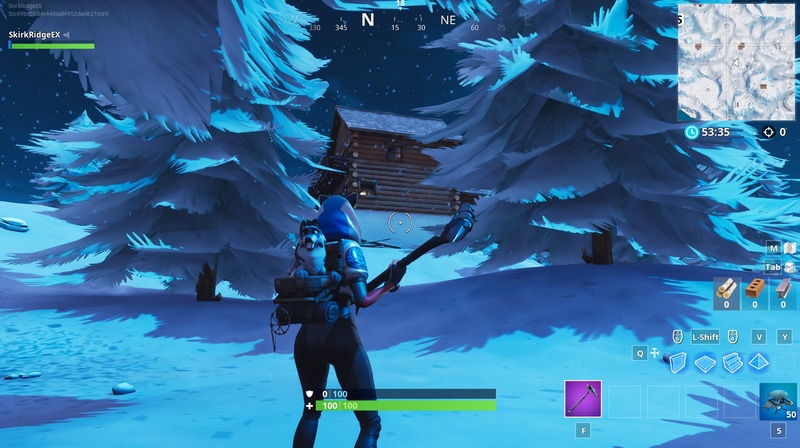 One of the Battle Star treasure hunts in Fortnite’s Season 7 requires you to go to the ski lodges close to the south-west of the map. Trying to find it on your own is a bit of a pain, and if others are trying to hunt in the same location, it can be a desperate fight to have the right to find it. This guide will go over where to find the emblem in question, as well as pinpoint the exact location where you need to be to unlock the emblem. Please note that this page is for a challenge that is no longer active in Fortnite. For a full list of currently active challenges, please go to our Fortnite week 8 challenges page. The area you’re looking for specifically is towards the south-western part of the map, between B9 and C9, where there’s a big central lodge with two others nearby. You want the most central one of the three of the triangle of ski lodges, which has a bunch of trees to the south. From the southern point of the ski lodge, head into the aforementioned trees. The screenshot above shows two trees in particular, which will be flanking the Battle Star, so click on the image to get a full size version. Just approach the gap in between and it should pop up. You may need to clear the two trees first by chopping them down with the pick axe in order to make it appear. This concludes our guide for the Battle Star location near the Ski Lodge, but there’s another challenge which involves ringing doorbells in multiple locations. You can check out our Doorbell locations guide to find out how to complete the doorbell challenge and the most optimal path to do so, without being killed en route.